Vince Cable has said he will not budge in his opposition to "fire at will" employment laws and remains convinced of the need to increase tax on the wealthy. The business secretary said cuts to red tape should be concentrated on complex immigration and tax rules rather than allowing "no-fault dismissal", as urged by some Conservatives. The strongly pro-business Michael Fallon and Matthew Hancock were both moved into Cable's department in David Cameron's reshuffle, seen as an effort to restrain the senior Liberal Democrat. Fallon told the Sunday Telegraph he wanted Britain to "salute" wealth creation "and stop thinking of new ways to tax it", scrap 3,000 regulations and make it easier to sack underperforming staff. Proposals for sweeping away bureaucracy are due to be published on Monday and a new industrial policy on Tuesday as the government continues efforts to kickstart its programme. Cable told BBC1's Andrew Marr Show that he considered Fallon a "very, very able and experienced politician" with whom he could work as well as he had other Conservative colleagues. "I like working with intelligent people with strong views. It makes politics more interesting. I have got David Willetts who is very, very able and likeable Conservative," he said. "We work well together. I know I will with the new team." He made clear that he retained strong views in areas that could put them on a collision course. Asked about Fallon's promised bonfire of regulations, he said it would only happen if it could be done "in a rational way" and without badly downgrading protection for employees and the environment. And he suggested that the main focus should be on immigration and tax. Cable said he had "set myself very firmly" against the call for a no-fault dismissal system made in the David Cameron-commissioned Beecroft report - and pointed out that Fallon was not responsible for that area. "It is very important that we do these things in a way that does not massively undermine people's sense of security. That is why we are not going down the no-fault dismissal line," he said. Asked about Fallon's comments about the "politics of envy" that sought to tax wealth creators, he said: "I think wealthy people could contribute more. There is massive wealth inequality. I do believe that entrepreneurs should be properly supported. But I continue to believe that we need effective wealth taxation." Cable backs the introduction of a "mansion tax" on £2m-plus properties. Fallon denied he had been parachuted into the department to "keep an eye on" Cable.He told the Sunday Telegraph: "We need to salute that and stop thinking of new ways to tax it – that kind of wealth creation. That's an attitude I want to help change. "We need to get away from the politics of envy in this country and salute those who not only create wealth but risk their own money to create jobs for other people. Above all I want business to feel it has a strong Conservative champion in the department." In an interview on the Sky News Murnaghan show, Fallon renewed his attack on proponents of a wealth tax, saying entrepreneurs and private equity bosses should be lauded like Olympic and Paralympic champions. "I was at the Paralympic Games yesterday and I think people have been really struck by the drive, the focus, the ambition of these champions," he said. "And we have got to do the same with our business leaders. We have got to get behind them. I am not talking about bankers I am talking about entrepreneurs." He said he would give details of about 6,500 of the regulations that most affect people's daily life in businesses on Monday, with a target to scrap or "substantially reduce" half of them. Bureaucracy that could be abandoned would include local authority health and safety inspections of low-risk businesses such as online publishers or digital marketing firms, he said. Asked about the Beecroft proposals, he said there was "no difference between Vince Cable and me on that". Reform had already started to end the perception that "getting rid of people is going to be very expensive, time-consuming for management and far too bureaucratic". Anda baru saja membaca artikel yang berkategori News dengan judul Vince Cable reiterates his opposition to 'fire at will' employment laws. Anda bisa bookmark halaman ini dengan URL http://portalsolo.blogspot.com/2012/09/vince-cable-reiterates-his-opposition.html. Terima kasih! 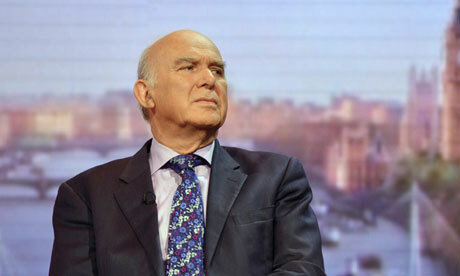 Belum ada komentar untuk "Vince Cable reiterates his opposition to 'fire at will' employment laws"